It’s been said here and elsewhere in the gospel music world over the last few years that the Old Paths were one of the best up-and-coming quartets in America. Let’s go ahead and remove one of the modifiers and call the Old Paths, simply, one of the best quartets in America. They’ve had four songs reach #1 on the Singing News chart since December 2012; no artist can claim more. They are reaping the rewards of consistency in their vocal lineup, working on three and a half years of Jeremy Peace at tenor, Tim Rackley at lead, Doug Roark at baritone, and Daniel Ashmore on bass. 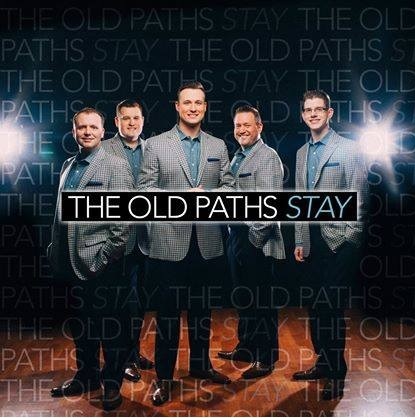 With their third major Crossroads release, Stay, the Old Paths are no longer out to show their worth among the top quartets in gospel music, but to continue providing the quality of music and songs that already put them on that tier. With the fantastic radio success the Old Paths have had, they are sure to draw the attention of gospel music’s top songwriters. And as songwriters go, there are none better right now than Dianne Wilkinson and Rebecca Peck. They wrote, individually and together, six of the ten songs featured on Stay. The three co-writes are three of the strongest songs on the recording. The opener, “Have You Ever,” is a bluesy number that sounds right out of the Kingdom Heirs playbook. It’s a sort of new sound for the Old Paths, but it works very well. “Washed in the Blood” busts out the fiddle for a fun country-style tune. Ashmore has one of the very best features of his young career on this song that declares the one true method of salvation. Finally, “How Great the Debt” is an outstanding big ballad feature for Rackley, out of the same stylistic mold as the hit, “Long Live the King”. After “racking” my brain, I can’t think of five lead singers in gospel music right now as good as Rackley, and he delivers again on this one. The Old Paths are always strong on the hard-driving quartet songs, and this recording’s best example is Wilkinson’s “What Did They Call Him”. If you’ve heard “It’s Jesus,” which Wilkinson wrote and the Mark Trammell Trio recorded more than a decade ago, you’ll find this song’s pattern familiar, but still enjoyable. A Peck composition found at the end of the album, “Out of the Grave” brings a much different type of high energy, trumpeting the victory of Christ’s Resurrection. Jeremy Peace is one of southern gospel’s singular talents, and he delivers this song in a way only he can. Peace also shines brightly on “You Never Cease to Amaze Me,” a worship ballad from Peck’s pen. Two names I’ve seen on lots of quality songs in the last couple of years are Rachel McCutcheon and Karen Gillespie, who co-wrote “Just Can’t Get Over,” Roark’s lone feature on Stay. With a memorable hook and an easy melody, it’s the kind of song that easily rings in the listener’s mind all day. Despite the large number of contributions from songwriting giants, the Old Paths still make sure to go back to the well of songwriters with whom they had previous success. Rodney Birch, most impressively, has written three of the quartet’s #1 hits: “Battle Stand,” “God’s Great,” and “Love Them to Jesus”. On Stay, he contributes “Ordinary People,” which bears a strong musical kinship to “God’s Great”. Would you believe they are releasing it as the first single from the new project? You can’t argue with that kind of success. The recording’s most poignant lyric comes from the title song, written by Ray Scarbrough (whose “He’s My Song” and “I’m Saved” the Old Paths have recorded). It illustrates the setting found in John 13 and 14. Jesus has just conducted the Last Supper, washed the disciples’ feet, and told them that He would be betrayed. The heaviness of chapter 13 gives way to the comfort of chapter 14, when Jesus promises both Heaven and the Holy Spirit to the grieving disciples. “Stay” will be sure to resonate with listeners with its touching message the Lord’s enduring closeness to His children. The main thing that keeps Stay from being one of my very top favorites, like the most recent efforts from the Kingdom Heirs, Mark Trammell Quartet, and the Kingsmen, is that there aren’t any strong convention-style quartet songs. That’s more of a personal stylistic preference than anything. The closest song to that on the recording is “Oh, What a Happy Morning,” which is another good bass feature for Ashmore. By now, the Old Paths shouldn’t be surprising any southern gospel fans with the quality of their music. They deserve to be mentioned in the same breath as Triumphant, the Mark Trammell Quartet, Legacy Five, the Kingdom Heirs, and the other top quartets in the industry. Stay will help keep them on that level, and they don’t appear to be letting up any time soon. Now that’s how a review is to be written. The Old Paths are a wonderful bunch of Christian men. Brian you just keep on writing reviews like this and God is gonna keep blessing your efforts. You have a great thing here and I’m sure glad you’re out there Praising God through your site.